Headfort’s Brian Casey moved up four spots to 14th in the race for five Challenge Tour cards via the Europro Tour rankings on Saturday. 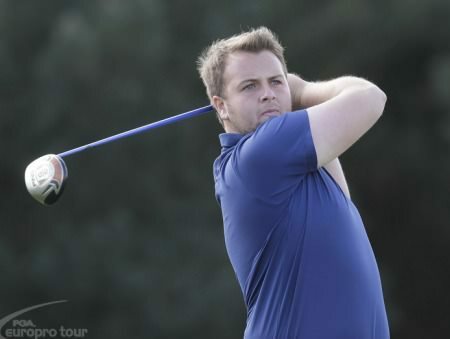 The former Mullingar Scratch Trophy winner closed with a one under 70 in the Clipper Logistics Players Championship at Moor Allerton Golf Club near Leeds, picking up £1,965 for a share of fourth behind England’s Mark Laskey. The Co Meath man, who makes his European Tour debut in the M2M Russian Open on an invite next week, finished on three under par, three shots adrift of Laskey, who shot a 68 to win by two from Steve Uzzell. The top five in the Europro Tour money list at the end of the season — the Race to Desert Springs— earn promotion to the Challenge Tour. Laskey is now seventh, just over £500 outside the top five with Alan Dunbar ninth, Casey 14th and Jonny Caldwell 31st. Europro Tour — Brian Casey got his season up and running with a second round 69 catapulting him to 10th in the Buildbase Open at Frilford Heath’s Red Course. Brian Casey picked up his best finish since last September when he finished tied for fourth as Gary King claimed his second consecutive HotelPlanner.com PGA Europro Tour title in the UK. EuroPro Tour — Headfort's Brian Casey moved up to 18th in the Race to Desert Springs standings after he picked up £6,000 for his second place finish behind Marcus Armitage in the Tree Of Life Championship at Close House.